Sarah Palin: Coming to a television near you! Sarah Palin, my favorite politician-turned-woman-seeking-freedom-from-all-that-political-stuff, is coming to TLC. The trailer for Sarah Palin’s Alaska or, as I like to think of it, the greatest gift Palin has ever given mankind debuted yesterday. I love it when public figures desperately attempt to reinvent themselves through reality television. It almost never works and provides me with an endless supply of entertainment. Palin, of course, must want to revamp her public persona and show off to the world the real, down-to-earth, mom that she is. Are you excited for this? Because I certainly am. I cannot wait for Kate Gosselin and her brood’s appearance. Thank you TLC for making this dreary October day a little brighter. Sarah Palin’s Alaska premieres November 14. 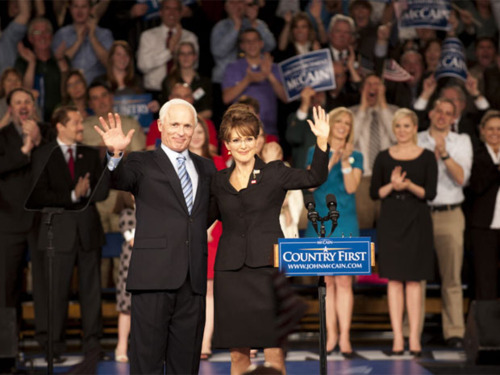 Author JoannaPosted on October 15, 2010 March 10, 2011 Categories Reality TVTags Sarah PalinLeave a comment on Sarah Palin: Coming to a television near you! Given the media-saturated culture we live in, where run-of-the-mill families strive for celebrity and then become vilified tabloid fodder, we shouldn’t be surprised when an unworthy public figure—Rod Blagojevich, Carrie Prejean—pens a memoir in defense of their character. Released on Nov. 15, former Alaska governor and GOP Vice Presidential candidate Sarah Palin’s memoir Going Rogue:?An American Life falls somewhere between fodder and defense. It is far too soon for us to be reliving her presence in the 2008 campaign, but to Palin’s credit, she has yet to film an appearance on I’m a Celebrity, Get Me Out of Here, so her public persona is (ever so slightly) more redeemable than most. In Going Rogue: An American Life, Sarah Palin offers an inside look at her childhood, her family life, her tenure as governor of Alaska and her 2008 vice presidential campaign. It is a book that is part memoir, part ode to Alaska and part self defense. Palin initially charms with stories from her childhood, her teenage years and her college days, which is understandable; these are the few private stories about Palin we were not privy to last November. It is when the book transitions to her years as Alaska’s governor and to the presidential campaign that Going Rogue becomes practically unbearable to read. Going Rogue becomes Palin’s platform to remind readers of her politics. Palin has always been up front about her beliefs, but what comes with this is Palin’s frequent ability to offend others. At one point, Palin writes about her unexpected fifth pregnancy with son Trig. “Sad,” Palin writes, “that our society has elevated things like education and career above the gift of bringing new life into the world.” Coming from a working mother of five, statements like these question Palin’s claims to her feminist identity. Palin paints herself as the heroine of small-town America, as a champion of fiscal conservative politics and as the ultimate victim of the 2008 presidential campaign. It is believable that Palin probably didn’t know the lengths to which she would be scrutinized as the vice presidential candidate, but there is only so much one can read about her blatantly naïve understanding of American politics and the election process. She questions, for instance, why Barack Obama’s family was left untouched by media when her family, namely daughter Bristol, became a major media fixation. Likewise, she comments on her now infamous interview with Katie Couric and calls the journalist and her interview style “badgering” as a way to prove how she was, yet again, wronged by the media during the campaign. Palin uses the final chapters of her memoir to criticize the Obama administration. She questions current White House policies, frequently asking “Is this what the president meant by change?” This chapter not only feels out of line and irrationally argued, but like one last strained attempt to prove to readers how she would have been the best choice for the country. I can’t help but think about Senator Ted Kennedy’s memoir, True Compass, which I recently read and reviewed for this newspaper. Say what you will about Kennedy the politician and the public figure, but there was probably no one more deserving than Kennedy to pen his memoirs. In it, he does not attack other politicians and he does not place the blame on the media for how his actions were received. Rather he writes intelligently and passionately about his life, his decisions and his career as he looks back on his life from the perspective of someone who is wiser because of his experiences. That is difference between True Compass and Going Rogue: one memoir was a lifetime in the making while the other took only months.